Tibetan cuisine is influenced by the weather condition in plateau and has its own characteristics. 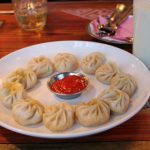 There are four major Tibetan food in Tibetan cuisine (also known as “Four treasures”): butter, tea, tsampa, and meat (mainly yak meat and mutton). The butter is extract from yak and goat milk. The process for making butter is special. After warming up the milk, people pour the milk into a big bucket and stir for hundreds of times until oil is separated from water. Then they take the floating fattiness to a leather pocket until it cools down to form the butter. Tibetan butter has high nutrient value and various functions. It is can make buttered tea and be added to tsampa. During festivals, butter is used to make deep-fried dough sticks. Tea is deeply loved by Tibetans. There are mainly three kinds of tea, buttered tea, sweet tea and light tea. Buttered tea is made from butter, tea, salt and water. It helps people keep warm and digest well. Tibetans serve guests and friends with buttered tea to show their friendliness and respect. Tsampa is a special Tibetan food made from highland barley. The making process is simple: first roast the barley, then grind it into flour. People always put tsampa in a bowl, add some buttered tea and stir with water until it forms dumplings. 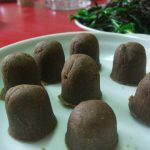 Tsampa is usually eaten with buttered tea. For meat, Tibetan people like yak meat and mutton. They make dried meat with some seasonings. Sometimes they will eat pork but they do not eat horse and donkey meat. Dog meat is forbidden. The style of Tibetan cuisine is light, only with salt, garlic and scallions, which shows their simple and natural life concept.